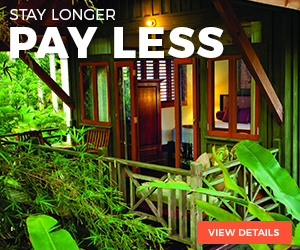 As many of our past guests know, Sunset at the Palms prides itself in giving guests a true taste of Jamaican culture. 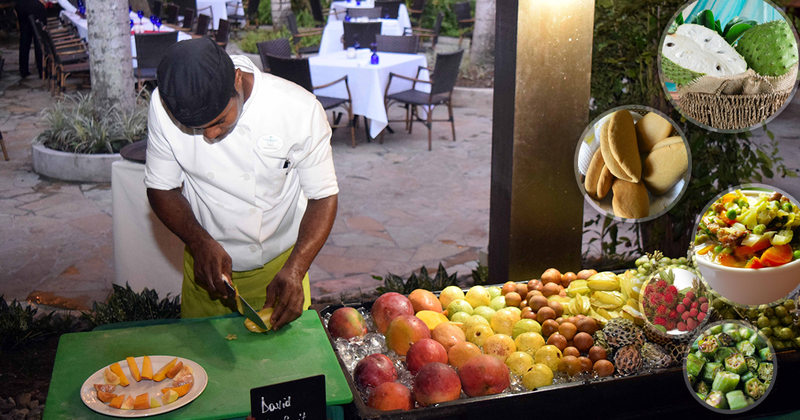 To that end, the resort’s culinary team strives to create menus that introduce visitors to the array of colorful fruits and vegetables, delicious seafood, and unique spices and sauces that combine to make Jamaican cuisine among the most popular in the Caribbean. On September 1 the resort welcomed a new executive chef, Conrad Moore, who has been with the company for five years but who worked on other parts of the island. In addition to cooking at other Jamaican hotels, Moore also spent time traveling the world as a chef on Celebrity Cruises, arriving in a different place each day and being presented with local products that challenged his kitchen creativity. He says that his vast travel experiences truly inform both what he does in the kitchen and how he interacts with people … including the 24 members of his staff. That team gets to step out from behind the scenes five times a week during Chef’s Showcase dinners, at which a limited number of diners see – and taste – exactly how local ingredients are transformed into memorable meals. Though the Showcase is available at no additional cost, it does require an advance reservation; seating – which is either in the resort’s lush garden or (in the event of inclement weather) in a special area of the main dining room – is limited. Moore thinks of the Showcase as a true platform for his team to develop their skills, not only in the kitchen but also in terms of guest service. Each dinner is coordinated by two or three members of the culinary team, who not only prepare the meal but also introduce it to their guests and respond to instant rave reviews. The Chef’s Showcase is perhaps the most special of the resort’s culinary offerings, but guests also enjoy relaxing dinners in the Lotus Leaf, the resort’s signature restaurant, and breakfast, lunch and dinner at the Palm Grove, a buffet-style dining room that doubles as one of the resort’s social hubs. Breakfasts include such regional favorites as ackee and saltfish and distinctive Blue Mountain coffee. Dinner buffets follow nightly themes, running the gamut from Seafood Night to Jamaica Night (the oxtail stew is not to be missed). On Wednesday nights when the weather cooperates, the entire operation moves down to the beach for a memorable BBQ that often ends with guests who had been strangers at the beginning of the evening sharing picnic tables and – if the mood strikes – having an impromptu dance party on the sand. The resort also offers weekly cooking classes so guests can learn their way around some of the most popular Jamaican dishes. We’re going to whet your appetite here with a quick A-to-Z introduction to Jamaican cuisine. If you’re inspired to get a taste of it yourself, begin planning your vacation to Sunset at the Palms by visiting www.thepalmsjamaica.com. Ackee – Tropical fruit that’s often paired with salted cod, known to locals as “saltfish.” Ackee and saltfish is one of Jamaica’s national dishes and is most often served at breakfast. Blue Mountain Coffee – World-famous coffee grown in the hills of Jamaica’s highest peak, the Blue Mountain. Dasheen – Tuber that’s also known as coco, and most often used in Jamaican soups. Escovitch – Jamaican variation of ceviche. The fish is usually fried and then pickled. Festival – Oval-shaped dumplings made with cornmeal, then fried to a delectably crispy finish. Guinep – Small, sweet fruit sold by the bunches on the roadside. It’s very similar to a lychee. Hotch Potch — Jamaican stew that usually includes fish or chicken with mixed vegetables. Jerk – Term that refers to the way a meat is seasoned and cooked. The cooking style is uniquely Jamaican, with the marinade composed of allspice, Scotch bonnet peppers, and a variety of other flavorful ingredients. Kola Nut – A nut used to make tea. Some Jamaicans claim that it’s the cure for food poisoning. Lychee – Chinese fruit with a brittle shell enclosing a sweet, jellylike pulp that surrounds a single seed. Jamaicans know not to pick these unless they’re ripe. Mannish Water – Hearty Jamaican soup made with a goat’s head and feet. It’s usually served as an appetizer at special parties and events. Naseberry – A sweet fruit that comes from a very slow-growing tree. Okra – This relative of the cotton and hibiscus plant is native to Africa and was brought to Jamaica from there. It can be eaten boiled or uncooked. Patty – Savory pastry with various fillings and spices baked inside a flaky shell. It’s traditionally filled with seasoned ground beef, but can also feature chicken, pork, fish, cheese and even ackee. Quinine – This gives tonic water its distinctive taste, making it a key ingredient in a variety of bar drinks. Rum – Distilled alcoholic beverage made directly from sugarcane or sugarcane by-products, including molasses. Jamaica’s favorite brand is Appleton Estate Rum. Ting – Jamaica’s popular carbonated beverage, which has a lively taste thanks to concentrated Jamaican grapefruit juice. Ugli Fruit – Jamaican citrus fruit created by hybridizing a grapefruit. Vinegar – This can be sweet or savory, depending on how it’s been steeped. Fresh herbs such as dill and tarragon make it savory; popular Jamaican fruit vinegars include those made with raspberries and blueberries. Water Biscuit – Bland yet crispy Jamaican cracker that’s often served with cheese. The biscuit itself doesn’t have a lot of taste, but it’s a great vehicle for whatever is spread or placed on top of it. Yam – This thick vine tuber is popular in Jamaica, across the West Indies and in parts of Africa. Jamaican yams are similar in size and shape to American sweet potatoes. Zombie – This Jamaican cocktail is made with at least two types of Jamaican rum and two or three fruit juices, such as pineapple, orange and lime.